Our days are getting longer, the rain has subsided, yet it’s still pretty chilly out. It’s beginning to feel like Spring though, with our service berry and camellias in bloom. I picked fresh thyme and chives yesterday. How is it where you are? Driving past the tulip and daffodil fields last week in Skagit Valley, there were fields of yellow and red as far as the eye could see. The tulips are a few weeks early this year due to our mild Winter and swamp-inducing rains. I’ve yet to wander through the fields but hope to get out there this weekend. Sometimes if we go early in the bloom season, we can beat the millions of others who come see the flowers welcoming Spring. Have you been? In the meantime, I’m seeing Spring greens and even berries appear across the blog-o-sphere, and I can’t help but be a little jealous. I’m trying to wait patiently for the local asparagus to come in. Until then, I’m holding on to Winter crops the farm continues to provide in abundance. We’re still swimming in squash, and kale is on the regular. 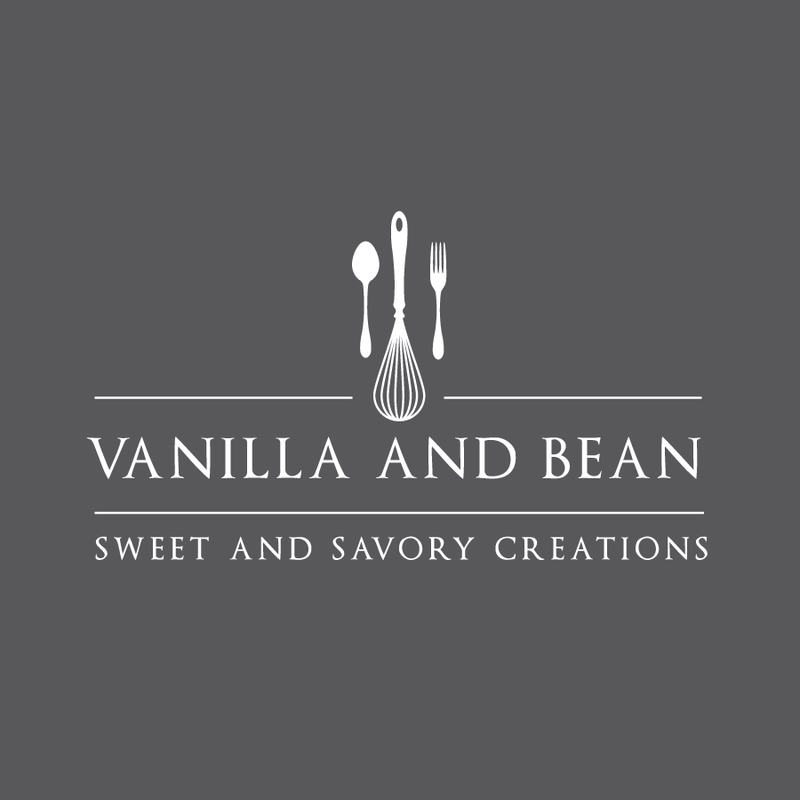 I use it almost like a pantry staple and so have many kale recipes here on Vanilla And Bean. I can’t help but love it. Not only is kale nutritious, but it’s a hearty green like chard and collards, so it works well in soup, casseroles, and anywhere one would require a sturdy green. If you “massage” it (stick with me), it’s fabulous in salads. Massaging helps break down the plant cell walls and tenderizes the leaves to make them more palatable. Cleans and washes away pesky hidden dirt and debris. 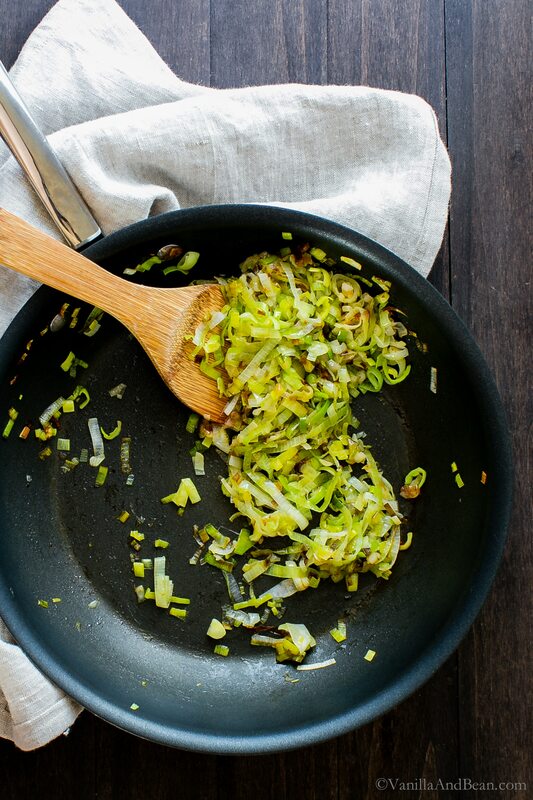 Destroys the enzymes that turn the veggies brown and mushy when cooking longer. Helps retain its bright green color and nutrients. If you want to freeze kale, blanch it first. Its color will go from a dark, purply green to a vibrant, bright green in about one minute. So if you see kale on sale grab it, blanch it, then freeze it. Use it just like blanched frozen spinach. How to blanch kale: Fill a medium sauce-pot half full of water. Bring it to a rolling boil, place the destemmed kale in the water, pushing it down into the water with tongs… don’t burn your fingers! Set a timer for one minute, then strain and plunge the kale into an ice bath to cool. Squeeze out as much water as possible then use or freeze. I totally wanted to title this Kale, Mushroom, Leek Savory Bread Pudding Shut The Front Door Weekend Brunch, y’all, because it’s so mouthwateringly tasty. But alas, I had to consider what Google wanted. I use crimini mushrooms in the recipe, but if you can find locally grown mushrooms at your farmers market, use them. A wild mushroom mix would be divine! This recipe can be made one day prior to when needed. Prepare the recipe, then cover and refrigerate it overnight. It’ll be ready when you are the next morning. Vegetarian Gruyere and Parmesan can sometimes be hard to find. If unable to locate either as a vegetarian cheese, sharp white cheddar would be a fine substitution. I’ve linked to a resource in the Notes section of the recipe. Savory bread pudding is also known as a strata. Why the confusion? What do y’all call it? A fabulously hearty and filling cheesy egg-bake. 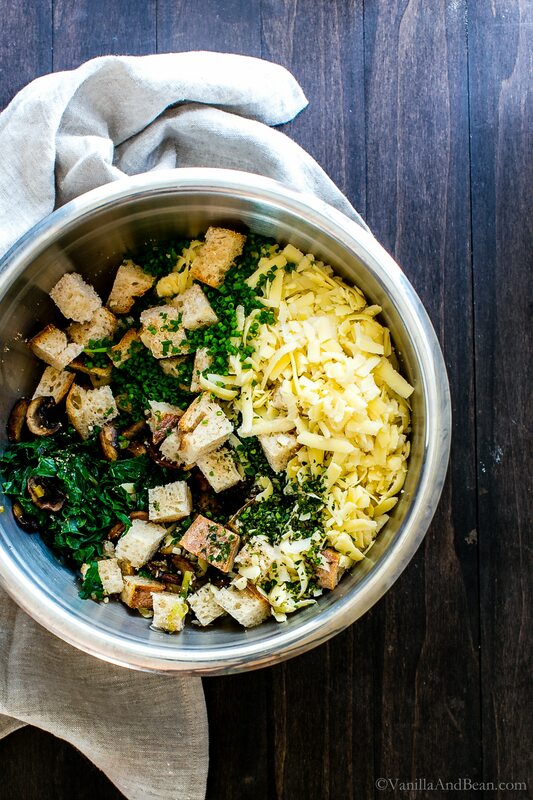 Kale, Mushroom and Leek Savory Bread Pudding is perfect for holiday gatherings or for a weekend brunch. Make and bake right away or make ahead, rest in the fridge, then bake in the morning. It's ready when you are. 2 Tbs Coconut Oil virgin, unrefined. Spray a 9"x13" (22cm x 33cm) baking dish with pan spray. Set aside. To blanch the kale, fill a medium sized sauce-pot 1/2 way with water and put it on to boil. Set up an ice bath. Place the kale in the boiling water and press down to submerge. Set the timer for 1 minute. Remove the kale and plunge it into the ice bath to cool. Strain and press out excess water, as much as possible. Place in large mixing bowl. Add 1 Tbs oil to a saute' pan, heat until shimmering. Add the leeks plus 1/4 tsp salt and cook on medium-low for about ten minutes, stirring occasionally until until soft. Some browning is good. Place the cooked leeks in mixing bowl with the kale. Clean and destem the mushrooms then slice thin. Add 1 Tbs oil to the same saute' pan, heat until shimmering. Add the mushrooms and cook on medium-low for about 5 minutes, stirring only a few times. We want to sear those mushrooms. Add the mushrooms to the mixing bowl. Reserve 1 C (60g) of bread cubes, and a few handfuls of cheese and set aside. Then add the remaining bread, chives, thyme and cheeses to the kale and leek mixing bowl. Mix throughly. 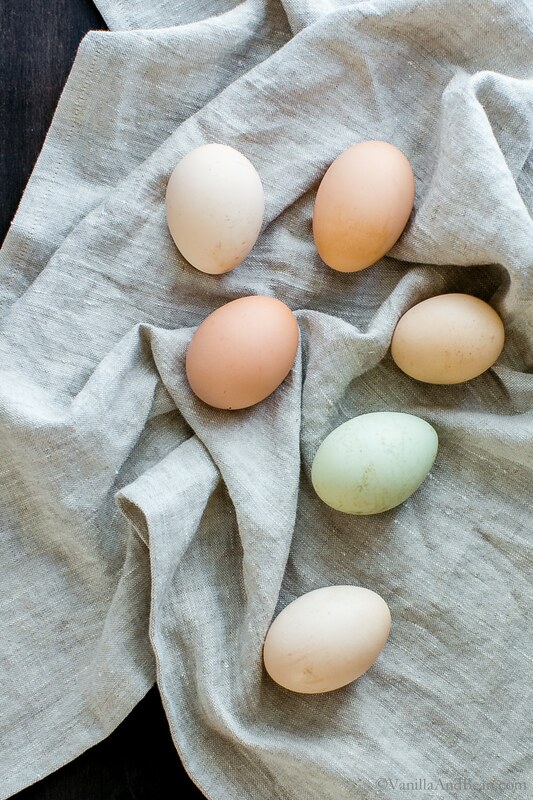 Crack the eggs into a medium size mixing bowl. Add the milk, mustard, remaining salt, nutmeg, and pepper. 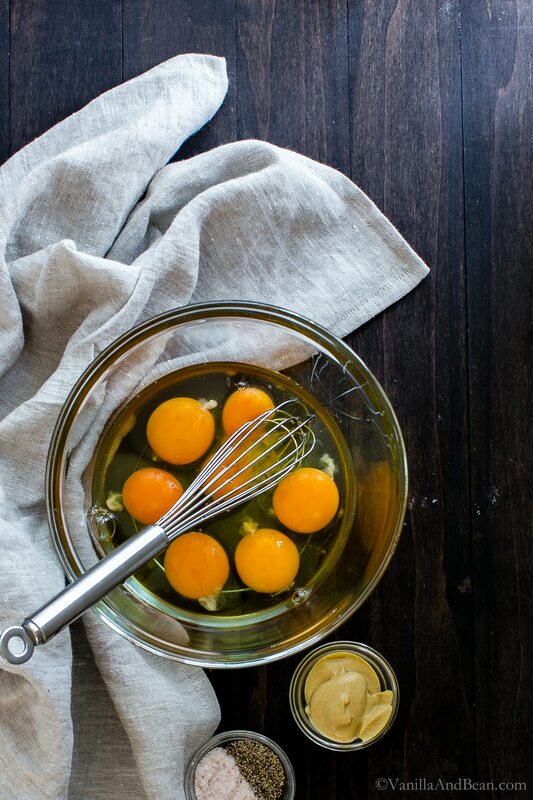 Whisk until all ingredients are incorporated. Pour bread mixture into the prepared baking dish. Pour egg mixture over the bread mixture. Using the back of a spatula, firmly press the ingredients into the pan. Sprinkle the remaining cheese over the top and firmly nudge the reserved bread into the cheese leaving it to stick out and crisp up as it bakes. This creates delicious little bits of crunchy goodness over the top of the dish. Cover and refrigerate overnight OR allow to rest for at least 30 minutes prior to baking so the bread mixture has time to soak up the custardy mixture. Bake uncovered at 350F (180C) on center rack for about 55 minutes turning 1/2 way through baking. This recipe makes excellent leftovers. To reheat, place in a 350F (280C) oven for about 10 minutes. *Sharp white cheddar is a fine substitution of a veg friendly cheese is unavailable. Look for veg friendly brands like BelGioioso for Parmesan and Boars Head for Gruyere. This resource will help you select vegetarian cheese. This looks amazing and I love the blanching kale advice thank you! I have a question.. im a vegetarian that loves cheese but sadly for me can’t stand the taste of eggs. Hope you feel sorry for me haha.. my question is.. why sub with veggie cheese but still use eggs? Maybe that’s a stupid question but I seriously am wondering. I’m going to find a way to make this with less eggs because all the other ingredients are my favorites! Hey Mardi! Thank you for your note. When I refer to vegetarian cheese, I’m referring to cheese made without using rennet. Some cheeses are made with it and is a no go for many vegetarians. Now, if you’re referring to vegan cheese, this recipe could be made with eggs for those avoiding dairy, but still eat eggs. I’m thinking this could be made using tofu, probably a medium to firm tofu, if avoiding eggs. I hope this makes sense! Oh my lord, Traci, this looks amazing! So happy I meandered over to Tastespotting this morning (err, almost afternoon) and discovered it. It is definitely WARM over here! The weather will be in the 70s for the weeks ahead. I feel like I’m not ready for warm weather yet! And if the weather is already in the 70s for early spring…I can’t wait what summer has in store for us! This is a beautiful bread pudding, Traci. Cheesy, full of veggies, and it looks so satisfying–my kind of meal, indeed! It’s too early for that heat! Us too, Lisa. Here we are at the end of March and we’re supposed to hit 70 by the weekend! :/ I’m dreading summer temps… oh no!! It’s sort of spring-ish here, although our grass is still brown…I can’t wait for a little green in my life! I love this savory bread pudding!! So creative. And good tips about blanching the kale, I will definitely have to try this next time. It would be so convenient to just throw a handful of frozen kale into a dish. 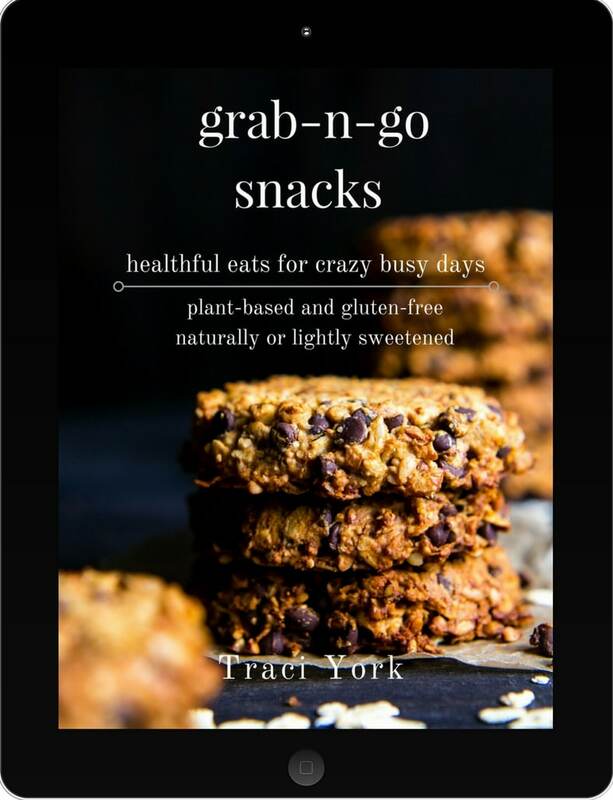 Yum – Traci, this looks absolutely amazing! I know what you mean about the markets. Our local farmer’s market still has ample squash and heaps of kale. But I’m not complaining:) Although, the weather is most definitely warming up. So spring-y things are so close…I feel it! I think this savory pudding is the definition of comfort food. I don’t think that there is anything I do not like in the list of the ingredients. I have made similar recipes in the past, but never used kale in any of them. Such a great idea. Spring is always behind here in Ontario. We don’t even get asparagus until late May usually! We also just got an ice storm yesterday so I’m not holding my breath for spring yet haha. Hey Chelsea, I don’t think he’ll notice. If you chop them both up extra small.. there’s so much going on in this recipe, he won’t even notice. I hear ya on the late Asparagus! We should have some locally soon. And an ice storm!? Oh my! Stay warm my dear! I wish I could join you for your walk through the tulip fields…I can imagine its beauty and effect on one’s overall mood (and blood pressure!). We have sunflower fields nearby and they’re nothing short of gorgeous. Helps me dream for a moment that I’m back on the Tuscan countryside… So, I love this dish. I love the mood your photos create (as always! )… though, I must admit, kale and I are not really friends (but how I’d love to change that!). Baby kale, perhaps? I’ve had that and liked it…but I haven’t ever used kale in my cooking. Perhaps I need to learn the technique of massaging it…I’ll keep with it – especially since I would love to try this recipe! Thanks for sharing, my friend! Have a lovely weekend! Well, we had a bit of Spring weather, but then got snow (ack!) and freezing temperatures all over again. I was very worried about the daffodils and crocuses that had bloomed already, but they seem to have survived. I love savory bread puddings and they were a staple in the French restaurant where I worked. We always called them strata’s though. And we kind of used them as a way to get rid of the leftover roasted veggies and bread at the end of the week! A little bit of cleaning out the fridge, if you will! Have a great weekend, Traci! XOXO! Thank you Rakhee!! Likewise my dear. No Spring!? Oh nooo… soon. I think it arrived here today! It’s amazing out. Replacing the eggs.. I’m thinking you may be able to do some sort of silken tofu like a tofu scramble (but that’s usually made with firm.. I think). If you experiment, I’d love to hear what you find! I’m surprised you haven’t had any asparagus yet! It’s all over the place here in Cali but I suppose our warmer weather allows for earlier harvest. It will be well worth your wait! It’s gorgeous out where you live, Traci! The awakening of all the beautiful blooms in Spring is such a sight to behold. We don’t have the glorious seasons here (all sunshine and rain). It may be hot and humid here right now but this savoury cheesy-mushroomy bread pudding speaks right to my belly! What a hearty brunch! Greetings from Virginia, where my radishes and scallions have just begun to sprout… and our first daffodil bloomed this afternoon. Spring has sprung! Love the bread budding- it’s absolutely gorgeous! Yesssssss! It was warming up here in Texas, but the last few days have been chilly and rainy, the perfect weather for this kind of cosy fare. Plus- leeks and mushrooms are always divine together! Thank you, Sarah! I’m with ya… the farmers market starts next week! Love this, Traci – the perfect warm and comforting dish for a spring night. We had a terrific wind storm here a couple of nights ago and this is the dish that I would have loved to eat on that chilly night. Love the combo of kale and mushrooms. And I’ve so envious that you live near tulip fields – what a gorgeous sight that must be! Hi Traci- I love your blog! The word strata is the plural form of stratum (Latin)- which means layers, or spreading, or laying something down. Or layers within something! A traditional Strata is made by layering the ingredients (hence its name), whereas a bread pudding generally has all of the ingredients happily jumbled up. Either way they are delicious! Thank you for all of your lovely recipes! Hey Jennie! Thank you so much for your kind words and clarification. I’ve seen the lines blurred with regards to what one calls these eggy dishes, but it makes perfect sense now! Glad I landed on pudding, :D with the veggies all jumbled up.. happily :D ! I have an abundant amount asparagus already that I’m trying to preserve now for later, pickling it in spears and small bite sized pieces. 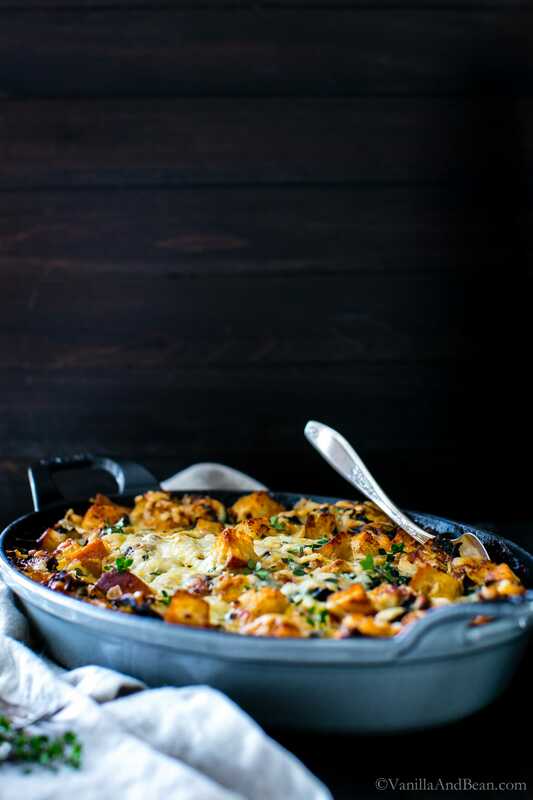 This dish combines all my favorite veggies and carbs in one-I can’t wait to try it! The weather is getting beautiful here Traci. In fact today it’s supposed to be 70 degrees or more! You are speaking to my heart with this dish today! I am a huge lover of any type of bread pudding, sweet or savory! I love ALL the ingredients in this one! Will have to trick Tom and say it’s spinach though! Cannot wait to give it a try! Happy Easter! Savory bread pudding sounds so good! And it looks seriously delish!! I’m looking forward to giving this a try! I make one really similar to this and you’ve reminded me how wonderful stratas/savory bread puddings are. I love making them the evening before and having it all ready the next day! 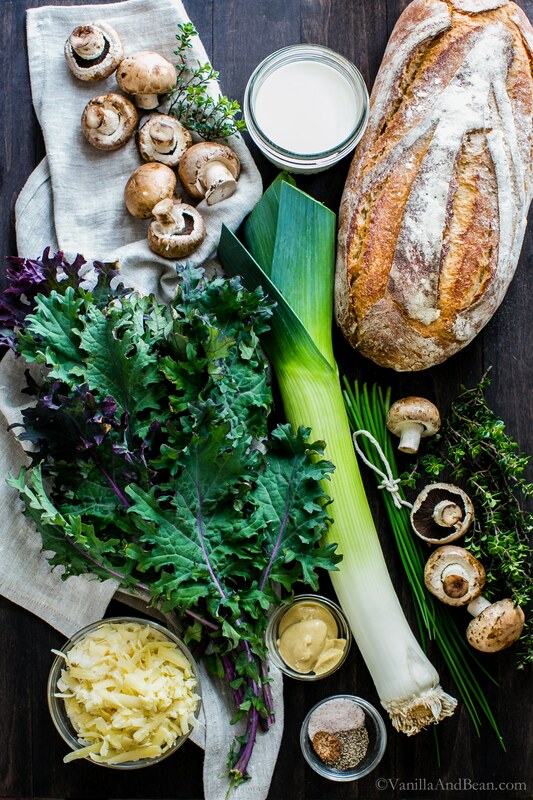 Kale and mushrooms are a favorite combo and leeks give it such a nice spring feel. And super impressed with that steam shot… I never get those right! Oh my… shut the front door good girl :) Can we arrange an extra large family size for Sunday brunch? Gorgeous! Yes indeed, getting intimate with kale is the way to go ;o) I eat it raw most of the time though and would love to explore more in savory warm dishes like this beauty. A perfect holiday weekend offering my friend – and you really capture the delicious essence in your photos. That egg carton, by the way, is just too cute! love.